I figured I had better get right to the description of those big, soft cinnamon-y apple cookies so you all who came for the cookies, got what you are here for, with no further ado. 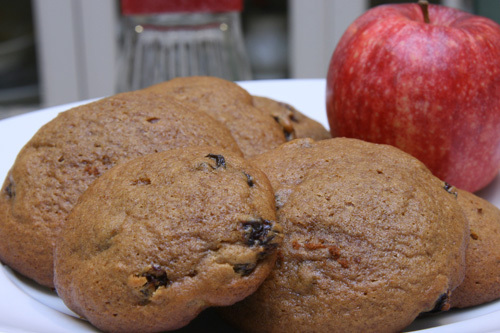 They are the perfect after school or work snack…especially served along side a healthy sliced apple and a tall, cold glass of milk. Ok, so there is no way possible to naturally work in my awesome Dalmatian Mini-Van I was driving all last weekend so I am just going to do it simply because I can. It’s my blog, and there really is no where else in the world in which I have total, 100% control. Why on earth does one drive a Dalmatian Mini Van, you might ask? I am a Girl Scout leader, and we were involved in a Halloween themed car rally last weekend. One of the requirements was that our car had to have a costume. WHAT? NOT WAY COOL YOU SAY?!!!! That’s news to me. Well, not really…my teenage son thought it was a kick to drive around in on Halloween itself, but after that the coolness factor goes way down it seems. How sad. Do you have any idea the number of thumbs up, smiles, outbursts of laughter and shout outs I got around town…even on Monday…the day AFTER Halloween?! Even on the truly dog-eat-dog streets of suburban L.A. (pun intended of course because I am just that cheesy), people would actually let me change lanes in front of them…there was no speeding up and trying to ace me out. Nice folks would offer up PARKING SPOTS…and no one, not a single soul, flipped me off in those 72 hours!!! That is a record in the Los Angeles area, really. I am a pretty good driver and yes, most of us good drivers get flipped off at least once a week around here. Does that not happen where you live? Good for you. Don’t move to L.A. You will be sadly shocked by our lack of driving etiquette. If you happen to travel out here, please don’t say I didn’t warn you, and come armed with two ready middle fingers, a sailor mouth, a fully functional car horn and a bible to wash away your sins of which there will be plenty. Anyhow, my car seems naked now that my troop has de-dalmatianed it, and sadly my life as a cranky Los Angeles driver has been reestablished. Ah well, lucky for me I still have a big plate of cake-y, cinnamon laden delectable cookies waiting to be dunked to wash away my woes. If you need a way to improve your day, please make these cookies. They are just that good. If you really need an excellent day, then decorate your car just like a dalmatian and see the miracle that happens on the roads of where ever you are. And, just as a bonus, you get to intentionally embarrass your teenage kids. It’s payback for all of those innocent times you have been falsely accused of totally embarrassing them. Win-win! In a medium bowl, thoroughly whisk together the flour, cinnamon, baking soda and salt; set aside. In a large saucepan, stir together the applesauce, raisins, and lemon zest. Bring to a simmer over medium-high heat. 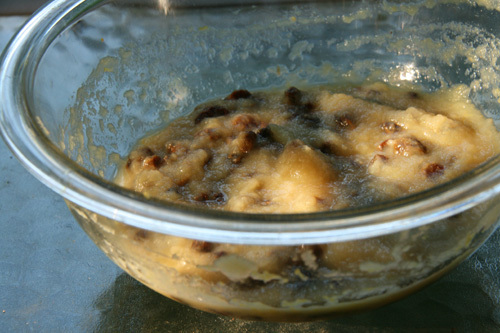 Cook, stirring frequently, until the applesauce is very thick and the raisins are rehydrated, about 10 minutes; be careful not to burn. Let stand until cooled slightly. Stir in the butter, brown sugar, and molasses until the butter melts and the ingredients are well blended. Stir in the egg and egg yolk and vanilla until evenly incorporated. Stir in the flour mixture until well combined (don’t over mix). Cover and refrigerate the dough until firm enough to handle, at least 2 hours or up to 24 hours. Preheat the oven to 350 degrees F. Grease several baking sheets or coat with nonstick cooking spray. I like to use Silpat mats (silicone mats). Place on the baking sheets using a medium icecream scoop, about 3 inches apart. Spread the 3 T. sugar in a shallow bowl. Grease the bottom of a large, flat-bottomed glass and dip into the sugar and then gently press down on each ball of dough. I did not sugar mine and did not miss the sugar one iota. If necessary, wipe the bottom of the glass and regrease. 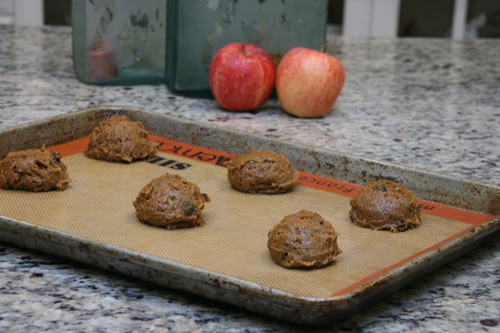 Bake for 11 to 14 minutes or until cookies are soft but slightly firm to the touch. The edges should be a little darker than the middle. Transfer to a wire rack after cooling for 3-5 minutes. Serve with a tall, cold glass of milk or a nice hot cup of coffee. Either will work just fine. Categories: Cookies | Tags: apple cookies, apple softies, car costume, dalmatian mini-van, girl scout car rally | Permalink. The mini van is so cool! I’d love to drive one like that 🙂 I love your aapple softies. They look wonderful. Thanks for the tips, I am no a baker so I could really use them. They are really easy so bakers and non-bakers alot will have success with these sure fire winners. what a cute looking mini van:) …. the recipe is just lovely… thank you for sharing this. I know…it’s awesome, isn’t? Thank you for the recipe comment. yum! maybe like apple pie in a cookie? Hi, Geni. What an entertaining post! I’d never come across a Dalmatian-mobile before. Is the Oscar Mayer Wiener mobile a canine relative? (That’s a stretch, but dashhunds are known as wiener dogs, too, right?) OK, it’s late, I’m not making sense on this tangent, and I’d guess I’d better stick to food. 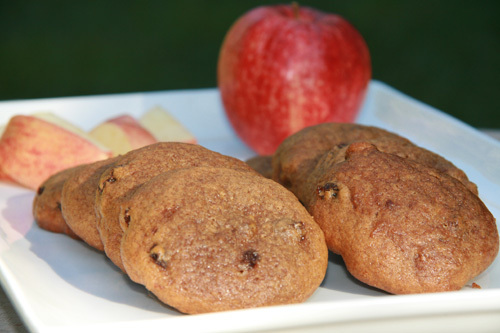 The cookies look distinctive, too…very autumnal and good for a cider accompaniment, I’d imagine. Your cookies look delicious. And I love the mini-van! I never thought of decorating my car for Halloween, but there’s always a first! I actually miss my dalmatian mini-van. It was fun! The cookies look yummy, it’s interesting to see lemon zest as one of your ingredients. What a cute mini-van…. :)) made me smile when I opened up your post:) Recipe as usual fantastic! 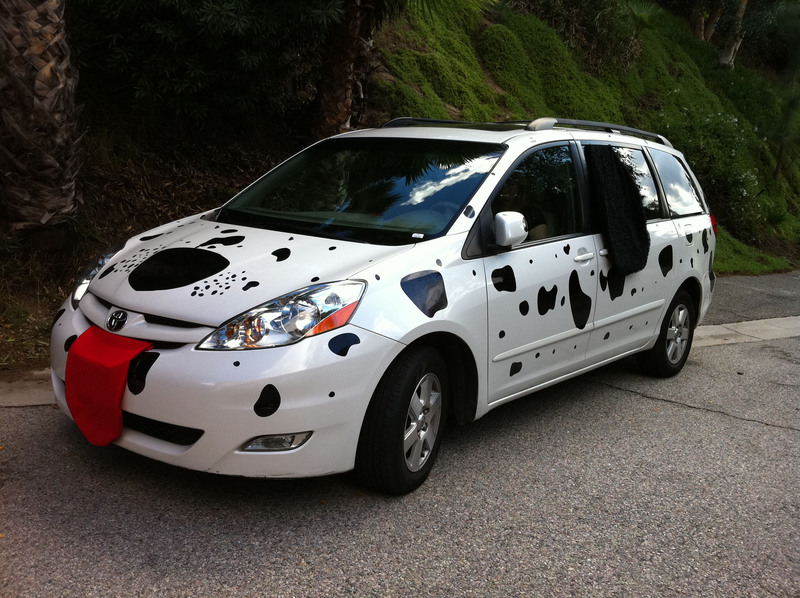 If having a dalmatian van is what it takes to have a more pleasant driving experience in LA, I’ll seriously consider it. The tongue is my favorite part! The cookies look just beautiful, and so soft! I highly recommend it. I still have the tongue and ears if you need to borrow them. Those cookies do look really, really good. I like how “fluffy” they look. And love the van decorations. That’s so creative! There are very cake-y. It’s kind of a nice variation on normal cookie texture. No surprise, those cookies sound incredible!! Ran across your blog looking for a Dalmation themed vehicle, thank you! How did you do the spots? They look so good! Did you hand make the spots, ears and tongue?